Nominations for 40 Under Forty Class of 2019 are now CLOSED. You may now submit nominations for 2020 consideration. 40 Under Forty is a celebration of young business and civic leaders in the Western Mass., and an undertaking in which our readership will play a pivotal role. Indeed, the process of selecting this region’s 40 Under Forty begins with nominations. And we urge you be thorough, because 40 Under Forty is a nomination-driven process; the background material submitted on a given individual is the primary source of information to be weighed by the judges who will score the candidates. 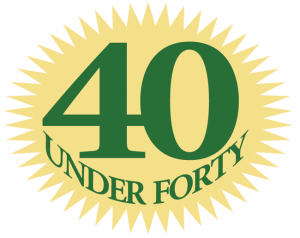 Please take a few minutes and help us identify the region’s 40 Under Forty. The selected individuals will be profiled in the April 29th edition of BusinessWest and celebrated at the annual 40 Under Forty Gala on June 20, 2019. • Deadline is February 14, 2020. No exceptions.